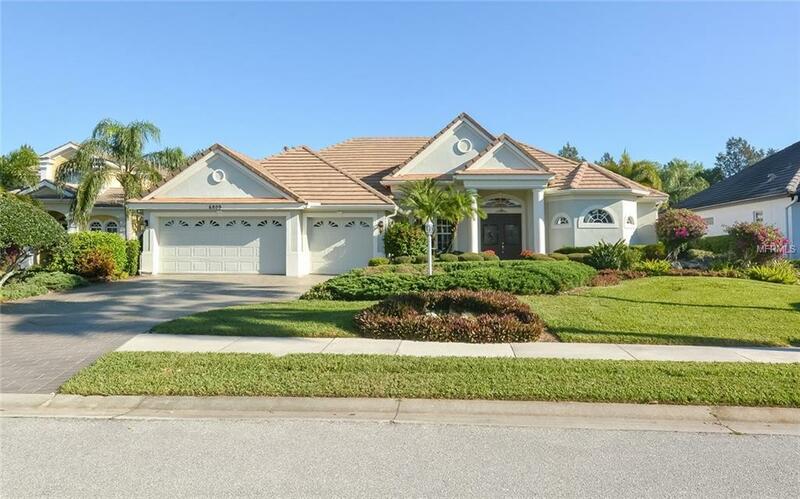 Luxurious home in Lakewood Ranch Country Club! Custom built home by Todd Johnson. Gorgeous lush landscaping, beautiful yard with spacious lanai, gas pool /spa. Pool pump 3 years old. 3 car garage. New double glass entry door. Hickory wood flooring. Cozy dining area and living room. Built in granite bar for entertaining. White cabinets with crown trim, 4 burner gas cooktop, stainless appliances, tile backsplash, granite counter with seating. Pantry has wood shelving. Separate breakfast area. Perfect desk area in kitchen. Grand family room with new ceiling beams. Gas fireplace with mirror above. Lovely built-in entertainment center. Large window brings in all the natural lighting. Den with stunning private yard view. Crown moldings. New lighting. Opulent owners retreat has double doors for privacy. Great sitting area, 2 walk-in closets, large center jetted tub, 2 sided walk-in shower, dual sinks, vanity and private water closet. Intercom system. Pool was re-surfaced 1 years ago. Complete privacy! Close to UTC Mall, dining, shopping, polo, the beaches.